Let's say you are shopping for a pair of pink stripe Fashion Color Dress Shoes but you just don't feel like spending tons of money on a pair. Well thanks to the Good People of Viotti and Contempo Suits, We've got your back. When it comes to making a stopping the crowd, you want to do it right the first time every time with a pair of Satin Stripe Dress Shoes. Viotti Satin Stripe Dress Shoes are just what you are looking for. These tuxedo shoes have a boatload of modern looking style. 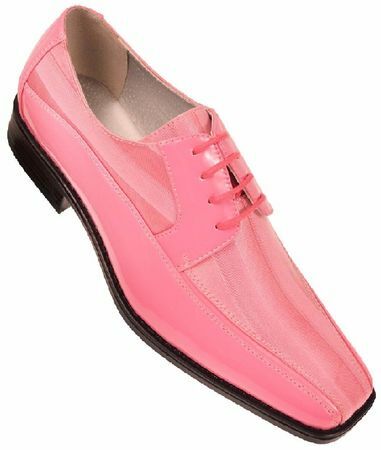 These Viotti Pink Satin Stripe Dress shoes features Tone on Tone Satin Stripe Fabric and Exotic Skin Print Trim Upper in a D Width with a Style that people will not forget. Shop Online for More Mens Fashion Color Dress Shoes Here.